In a large nonreactive pot, mix the apples, all but 2 Tbs. 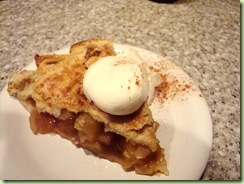 of the cider, the brown sugar, cinnamon, and nutmeg. 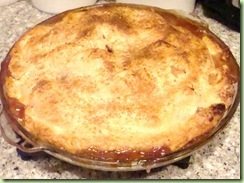 Bring to a boil over high heat, stirring often, until the sugar has dissolved and the apples are evenly coated. Mix the cornstarch and remaining 2 Tbs. cider into a paste; add this to the apples. Stirring constantly, boil until the liquid is thickened and clear, about 1 min. (you’re not cooking the apples, just thickening the juices). Taste and adjust seasonings if needed. Remove from the heat and let cool. My in-laws are in town this week, so I decided to make a special dinner tonight, especially since they are going to watch the kids this weekend while Scott and I enjoy a weekend away! 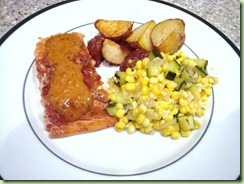 I made Salmon (wild Alaskan… also in season) with Red Pepper and Caper sauce, corn and zucchini saute, and roasted potatoes. From my box this week I used the red peppers (roasted them in the oven to use them as the base for my sauce, rather than using jarred red pepper), corn, and zucchini. Put the peppers, vinegar, mustard, and garlic in a blender and begin to puree. With the blender running, add the oil in a thin, steady stream. Transfer to a small bowl, stir in the capers, parsley, 1/2 tsp. salt, and 1/8 tsp. pepper. Season to taste with more salt and pepper if needed. Soak a cedar plank in cold water for at least 1 hour and up to 12 hours. In a small bowl, mix the sugar, cumin, pimentón, 1-1/2 tsp. salt, and 1/2 tsp. pepper. Sprinkle the mixture over the salmon and let sit at room temperature for 30 minutes, or cover and refrigerate for up to 12 hours. Prepare a two-zone fire on a gas or charcoal grill: On a gas grill, set two of the burners to high (one if your grill only has two burners) and leave one burner off. On a charcoal grill, push all of the lit coals to one side of the grill. Set the cedar plank on the grill over the hot zone, cover the grill, and wait until the plank starts to smoke, 2 to 3 minutes. Meanwhile, rub the skinned sides of the salmon fillets with the oil. Slide the plank to the cooler zone and arrange the salmon on top, oiled side down and thicker ends closest to the hot zone. Cover the grill (vents open on a charcoal grill) and cook until the fish is almost cooked through with just a touch of pink in the center—make a nick with a paring knife in the thicker part of a fillet to check—or an instant-read thermometer inserted in a thick part registers 135°F, 10 to 14 minutes. Transfer the fish (still on the plank) to a serving platter and serve with the sauce. Melt 1 Tbs. of the butter with the olive oil in a 10-inch straight-sided sauté pan or Dutch oven over medium-low heat. Add the onions and 1/2 tsp. of the salt, cover and cook, stirring occasionally, until the onions are soft and translucent, about 5 min. Uncover, raise the heat to medium, and cook, stirring frequently, until the onions are light golden and shrunken, another 3 to 4 min. Add the remaining 1 Tbs. butter and the zucchini. Cook, stirring occasionally, until the zucchini is slightly shrunken and almost tender, about 3 min. Add the corn, garlic, and the remaining 1/2 tsp. salt. Cook, stirring frequently and scraping the bottom of the pan with a wooden spoon, until the corn is tender but still slightly toothy to the bite, 3 to 4 min. (It will begin to intensify in color, glisten, and be somewhat shrunken in size, and the bottom of the pan may be slightly brown.) Add the cumin and coriander and cook, stirring, until very fragrant, about 30 seconds. Remove the pan from the heat, add all but about 1/2 Tbs. of the mint, a good squeeze of lemon, and a few generous grinds of pepper. Stir, let sit 2 min., and stir again, scraping up the brown bits from the bottom of the pan (moisture released from the vegetables as they sit will loosen the bits). Season to taste with more salt, pepper, or lemon. Serve warm, sprinkled with the remaining mint. A dozen corn… I don’t have that much dental floss! If you don’t want to spring for a corn zipper, you can always use Paula Deen’s trick of putting a piece of corn in the middle of a bundt pan and using a sharp knife to slice off the kernels! Anyway, on to the recipes. My very favorite corn recipe is this corn saute, from the magazine Fine Cooking! This recipe will also utilize the leeks found in this week’s box! Make this for guests, and they will keep coming back for more! Heat 1 Tbs. of the olive oil in a 10-inch straight-sided sauté pan or Dutch oven over medium-low heat. Add the pancetta and cook, turning occasionally with tongs, until light golden and crisp, 5 to 7 min. Transfer the pancetta to a plate lined with paper towels, leaving the fat in the pan. Increase the heat to medium and carefully add 1 Tbs. of the butter to the fat. When melted, add the leeks and 1/2 tsp. of the salt. Cover and cook, stirring occasionally and scraping up any browned bits from the pancetta, until the leeks are softened and slightly shrunken, 3 to 5 min. Uncover and cook, stirring frequently, until lightly browned, 1 to 2 min. Add another 1 Tbs. of the butter, the remaining 1 Tbs. olive oil, the mushrooms, and the remaining 1/2 tsp. salt. Cover and cook, stirring occasionally, until the mushrooms are softened and a little shrunken (they will have given off a good bit of liquid), 3 to 4 min. Uncover and cook, stirring frequently, until the liquid evaporates and the mushrooms are lightly browned, 2 to 3 min. (the bottom of the pan will be quite brown). Remove the pan from the heat, add the fresh herbs, a few generous grinds of pepper, and a good squeeze of the lemon. Stir in the heavy cream. Let sit a minute or two and stir again, scraping up the brown bits from the bottom of the pan (moisture released from the vegetables as they sit will loosen the bits). Season to taste with more salt, pepper, or lemon. Crumble the reserved pancetta over top and serve warm. So… that will get rid of about 1/2 dozen of your corn… what to do with the rest? Soup is always a great answer to using left over produce. There are all sorts of wonderful corn chowder recipes out there… but this is actually my favorite corn soup recipe, from Bon Appetit. Keep checking back… I’ll be whipping up my SIL’s birthday meal this week and plan to use up as much of my fresh produce as I can! I see this blog as a service to all my Facebook friends… you no longer have to suffer through my numerous food posts… and worse, food pictures! The real reason for this blog is to promote the Farmers Fresh Market – a group that brings locally grown produce to the Charlotte area. All of the produce is grown in Rutherfordton county, NC and is picked the day before you get it… not the month before, like with what you get in your local supermarket! I can’t say enough about how fresh and delicious all of the produce is, and that the money goes directly to our local farmers makes it that much better!